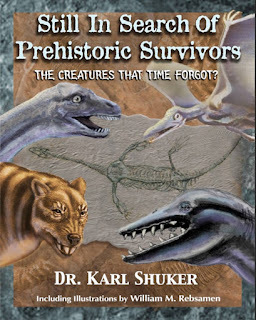 STILL IN SEARCH OF PREHISTORIC SURVIVORS - AFTER 21 YEARS, THE WAIT IS FINALLY OVER! 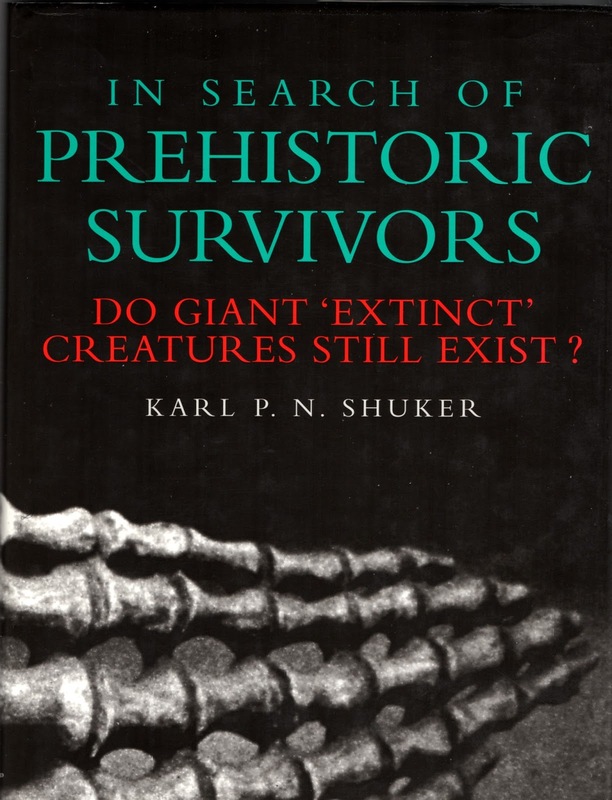 It has been 21 years since the original publication back in 1995 of In Search of Prehistoric Survivors , considered by many to be my finest cryptozoological volume. Not surprisingly, then, in subsequent years there has been a growing, persistent clamour among its numerous fans worldwide for me to prepare a new, updated edition. Now, at last, fulfilling a longstanding promise, I have done so - and what an update it is! 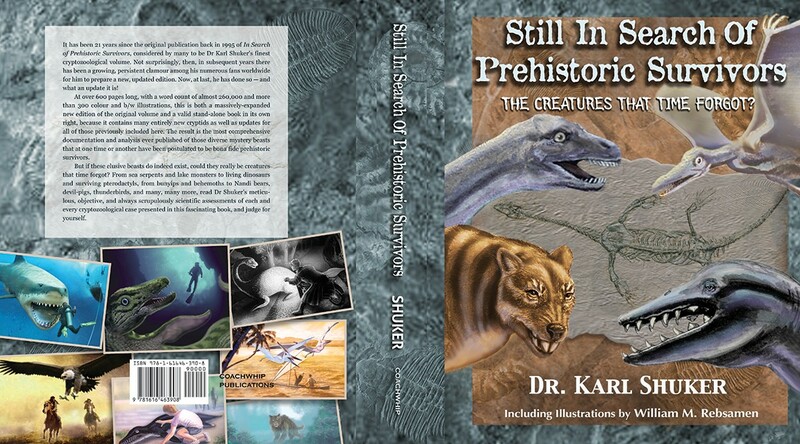 At over 600 pages long, with a word count of almost 260,000, more than 300 colour and b/w illustrations (including many stunning renditions plus spectacular cover artwork by acclaimed crypto-artist William M. Rebsamen), and a brand-new foreword penned by fellow crypto-chronicler Michael Newton, this is both a massively-expanded new edition of the original volume and a valid stand-alone book in its own right, because it contains many entirely new cryptids as well as updates for all of those previously included here. 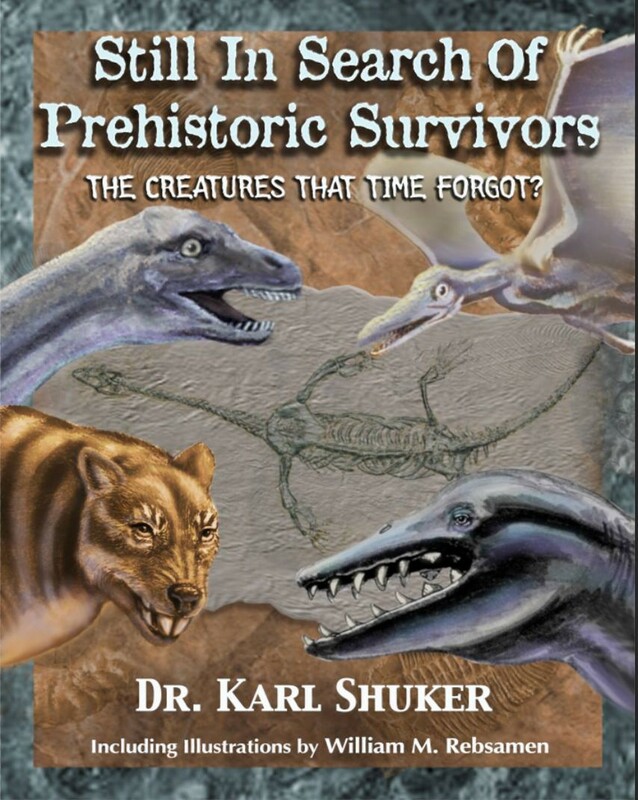 The result is the most comprehensive documentation and analysis ever published of those diverse mystery beasts that at one time or another have been postulated to be bona fide prehistoric survivors. 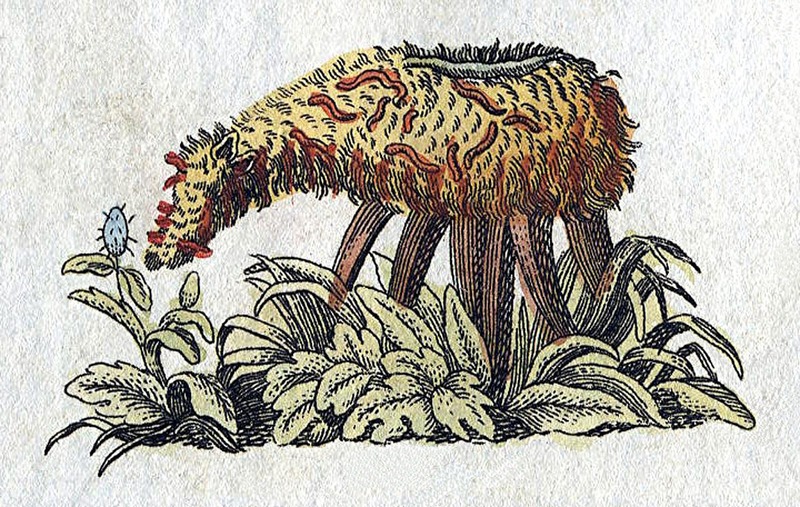 But if these elusive beasts do indeed exist, could they really be creatures that time forgot? 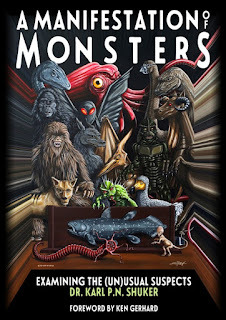 From sea serpents and lake monsters to living non-avian dinosaurs and surviving pterodactyls, from bunyips and behemoths to Nandi bears, devil-pigs, thunderbirds, thylacoleonids, and many many more, read the meticulous, objective, and always scrupulously scientific assessments of each and every cryptozoological case presented in this fascinating book, and judge for yourself. 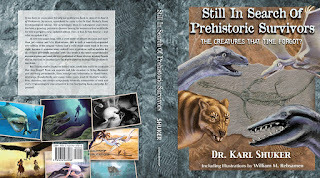 An ideal Christmas present for every cryptozoological enthusiast, Still In Search Of Prehistoric Survivors can now be ordered on Amazon and elsewhere online – click here to visit its dedicated page on my website, which contains direct clickable links to its purchasing pages on Amazon USA and Amazon UK respectively. And if you order it here on Amazon USA between now and November 28 (up to 02:59 am EST) 2016, using the promo code HOLIDAYBOOK at checkout under the "Gift cards & promotional codes" section, you will save a sizeable $10 off its selling price!! Snakes of all kinds are held in great horror by the natives of India, and they slay indiscriminately and ruthlessly all they come across, but this horror pales before the terror inspired even by the names of the bis-cobra and goh-sámp,—terror so great, that, if met with, the harmless animals are given the widest berth possible, and their destruction is never attempted. Though actual animals, they are virtually mythical, that is as regards the deadly properties assigned to them, and we easily recognise in them the originals of the flame-breathing dragon and deadly basilisk. The gaze of the bis-cobra is awful even from a distance and its bite is instant death; and if the goh-sámp breathes upon, or at you, you fall dead at once. 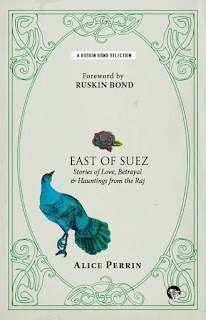 In villages across the length and breadth of India even today, there remains tangible fear concerning a creature that may be small in size but is gargantuan in terms of the terror that the mere sight of it generates. Known most commonly as the bis-cobra, according to generations of fervently-believed native folklore and superstition this modest-sized Asian lizard has such a venomous bite that anyone so inflicted will die instantly. Needless to say, no species matching this description is known to science. Yet there is no doubt that the bis-cobra does exist. So what precisely is this noxious entity, and how can these contradictions be resolved? The name 'bis-cobra' (or 'biscopra'), which is used most prevalently in western India, loosely translates as 'venomous cobra'. Bearing in mind that all cobras are venomous, this is a particularly direct, hard-hitting way of emphasising just how exceptionally toxic this animal is – or, to be more accurate, allegedly is. But of all the things in this earth that bite or sting, the palm belongs to the biscobra, a creature whose very name seems to indicate that it is twice as bad as the cobra. Though known by the terror of its name to natives and Europeans alike, it has never been described in the proceedings of any learned society, nor has it yet received a scientific name. In fact, it occupies much the same place in science as the sea-serpent, and accurate information regarding it is still a desideratum. The awful deadliness of its bite admits of no question, being supported by countless authentic instances; our own old ghorawalla [horse-keeper] was killed by one. The points on which evidence is required are – first, whether there is any such animal as the biscobra; second, whether, if it does exist, it is a snake with legs or a lizard without them. By inquiry among natives I have learned a few remarkable facts about it, as, for instance, that it has eight legs, and is a hybrid between a cobra and that gigantic lizard commonly miscalled an iguana [in India, 'iguana' is a term popularly misapplied to monitor lizards]; but last year a brood of them suddenly appeared in Dustypore, and I saw several. The first was killed by some of the bravest of my own men with stones, for it can spring four feet, and no one may approach it without hazard of life. Even when dead it is exceedingly dangerous, but, with my usual hardihood, I examined it. It was nine inches long, and in appearance like a pretty brownish lizard spotted with yellow. It has no trace of poison-fangs, but I was assured that an animal so deadly could dispense with these. If it simply spits at a man his fate is sealed. After some effort, EHA finally managed to capture a bis-cobra alive in his own garden using a butterfly-net, much to the great consternation of his native butler, watching the proceedings from a considerable distance. He then kept it for a time as a pet, without suffering any adverse effects. 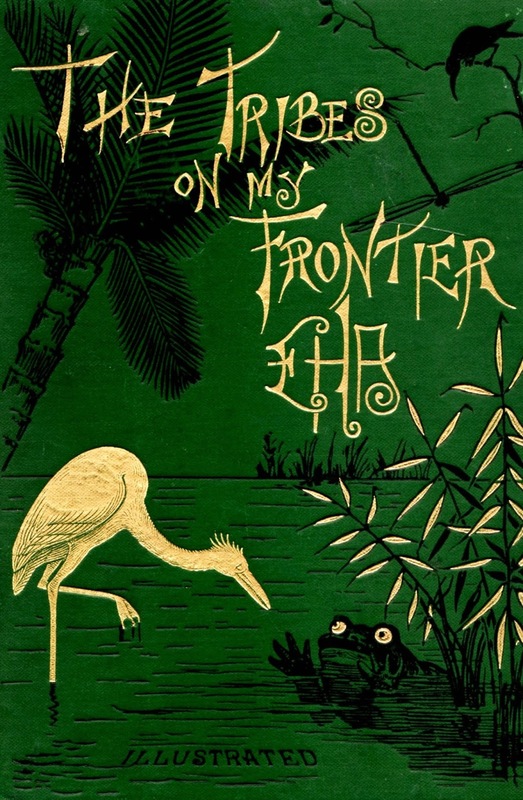 Pre-dating EHA's account by several decades, however, was a lengthy report on the bis-cobra by a Mr John Grant that featured in the inaugural volume of the Calcutta Journal of Natural History, published in 1840. In it, Grant referred to a specimen of a reputed bis-cobra specially captured for him to examine. Approximately 6 in long, it was attractively patterned with irregular streaks of small bead-like markings of alternating dark and light grey colour. Anxious to observe its lethal effect, Grant introduced a mouse into the glass container housing this lizard. But far from the mouse meeting a rapid demise, it fought spiritedly with the lizard for a short time, each biting the other, before the two combatants retreated to opposite sides of the container, neither of them appearing any worse for their savage encounter. So much for the bis-cobra's virulent venom. In her book East of Suez (1901), Alice Perrin included an eventful incident in which a European living in India demonstrated dramatically but beyond any doubt that the bite of a bis-cobra was harmless. He achieved this by lifting a brown and yellow specimen out of a pot in which it had been trapped, and then, when it seized hold of his hand with its teeth, holding it up, still biting him, for all of his horror-stricken native helpers to witness. After anxiously waiting for a while to watch their doomed master's fully-anticipated demise, they finally dispersed when it became clear that he was totally unharmed. Perrin also documented an encounter with a tree-climbing bis-cobra, measuring about 14 in long. EHA was not the only source of native lore claiming that the bis-cobra doesn't even have to bite in order for its venom to prove lethal. Several other writers have also alleged that it only has to spit a single drop onto someone's skin for its potency to prove instantaneously fatal, searing through the victim's skin, entering their bloodstream, and eliciting certain death. Indeed, in his book Indian Peepshow (1937), Henry Newman was even assured by a local man that if this dire lizard so much as spat at a tree (let alone a person), a hole would burn right through and the tree would die. In parts of India outside the western zone where reports of the bis-cobra are most rife, this supposedly deadly beast is conflated with another mysterious but equally malign reptile called the hun khun. Likened to a small slow-moving lizard with a fat tail, much the same powers of venomous potency are attributed to it as to the bis-cobra, but even the blood of the hun khun is reportedly toxic, and its skin reputedly contains lethal poison glands. As science knows of no species corresponding to the bis-cobra, how can this enigmatic lizard be explained? Down through the decades, several different zoological identities have been proposed for it. 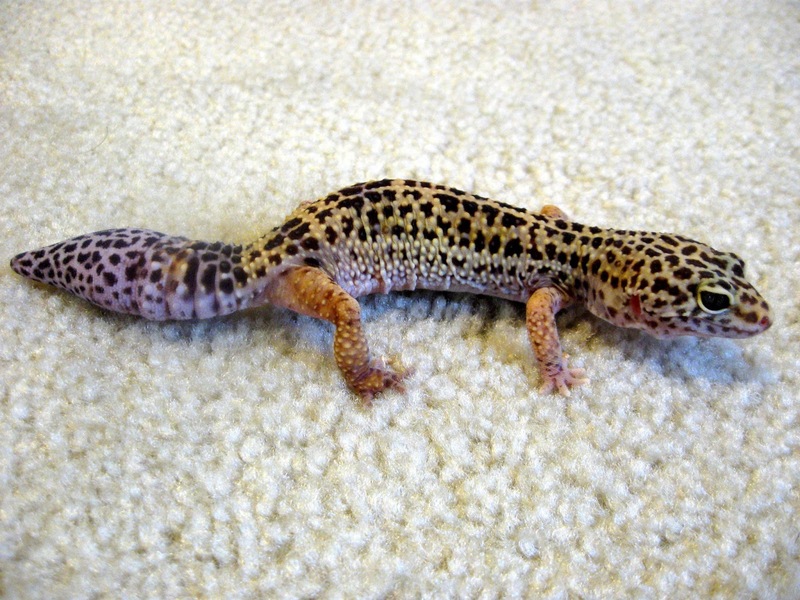 In their book Venomous Reptiles (1969), Sherman and Madge Minton proposed that the bis-cobra was the East Indian leopard gecko Eublepharis hardwickii, a small stout species with a noticeably thick tail. Of course, as this gecko (like all others) is wholly harmless, in order to accommodate its identification as the bis-cobra the latter's dread reputation as a highly venomous creature must necessarily be nothing more than native superstition and folklore. 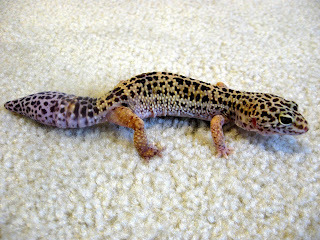 The Mintons identified the hun khun as the closely related fat-tailed or common leopard gecko E. macularius. Henry Newman noted that in the hotter, drier parts of India, 'bis-cobra' was a term applied to a rarely-seen, fleet-footed species of grey lizard. And that in Eastern Bengal, it is an elusive crested lizard occasionally spied in gardens and on walls. 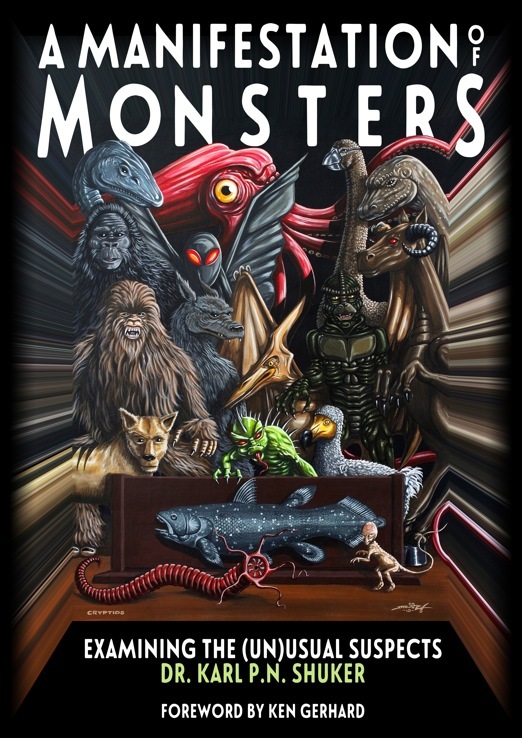 In his recently-updated two-volume encyclopaedia of cryptozoology, Mysterious Creatures (2013-14), George Eberhart noted the Mintons' view. He also speculated that an alternative explanation for the bis-cobra is that it is a non-existent composite beast, created by locals combining (and sometimes confusing) reports of venomous snakes with non-venomous lizards. Some people would jump to the conclusion that it was a young iguana to begin with. My butler would endure the thumbscrew sooner. Similarly, in his above-documented Calcutta Journal of Natural History report from 1840, John Grant concluded that the specimen which he had pitted against the mouse was nothing more than a young goshamp – a local name in present-day Bangladesh and West Bengal for the common Indian (Bengal) monitor Varanus bengalensis. This species is widely distributed throughout the Indian subcontinent, and whereas adults are mainly terrestrial, juveniles are more arboreal, thereby explaining reports of tree-climbing bis-cobras. Their spotted patterning also matches morphological descriptions of the bis-cobra. The large lizard, varanus [sic] dracaena, which is perfectly innocuous, like all Indian lizards, is called the bis-cobra by some. 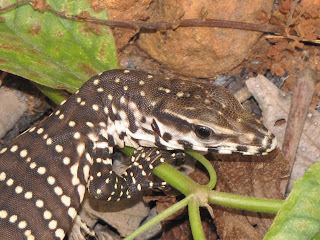 Varanus dracaena is a synonym of Varanus bengalensis. Kipling actually owned a pet specimen of this monitor species, and whenever he held it he was invariably warned of its supposed deadliness by native observers. Monitors were also confidently identified as the bis-cobra by L.S.S. 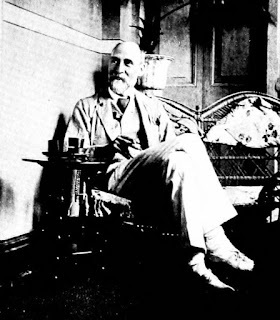 O'Malley in his book Bengal, Bihar, Orissa and Sikkim (1917). In Eye in the Jungle (2006), acclaimed Tamil writer M. Krishnan affirmed that the dreaded bis-cobra has been shown by naturalists to be nothing more than young, harmless specimens of the common Indian monitor – a statement confirmed in the standard work on this varanid species, Walter Auffenberg's monograph The Bengal Monitor (1994). Today, therefore, the term 'bis-cobra' is treated merely as a synonym for the latter monitor. All that remains to explain now are supposed cases (such as that of EHA's ghorawalla) in which a bite from a bis-cobra, i.e. a young Indian monitor lizard, caused a person's death. If such cases are indeed genuine, how are such deaths possible, bearing in mind that V. bengalensis is not venomous? Various possibilities come to mind. For instance, in recent years it has been shown that certain varanids, notably the Komodo dragon V. komodoensis, do actually possess venom glands. Although the venom produced by them is not normally fatal to humans, someone exceptionally sensitive to it may conceivably suffer anaphylaxis in a manner comparable to the response of certain people to the venom in bee or wasp stings. And even if no venom is present, the bacteria present on the teeth of these lizards could readily infect a wound created by a bite from one, and thus induce septicaemia. Moreover, the superstitious fear generated by the bis-cobra may in itself be sufficient to bring about death by heart failure in someone bitten by a monitor lizard. 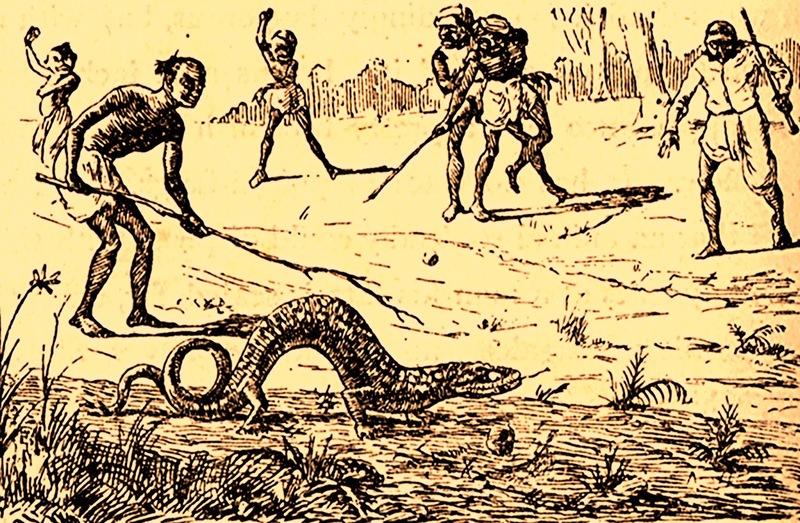 It may well be that isolated incidents involving one or more of these causes of death following a bite from a technically harmless lizard were sufficient to engender the tenacious myth of the lethal bis-cobra, especially among medically-untrained villagers. It would also explain the diversity of lizard species claimed by them to be the bis-cobra at one time or another. 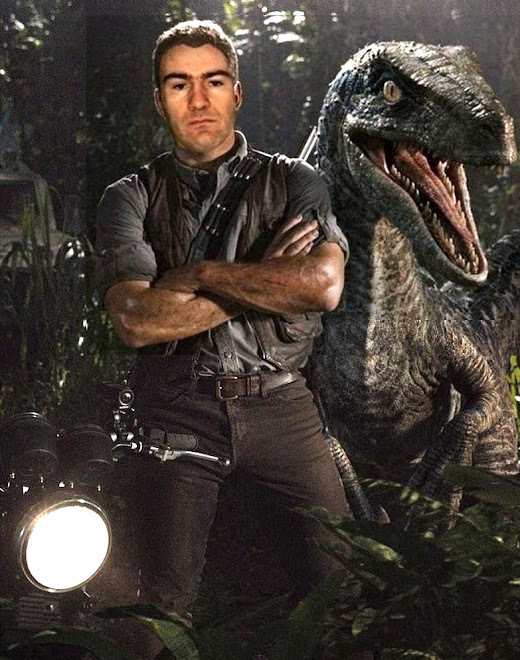 The ultimate result was a fascinatingly Frankensteinian creation of the deadliest lizard that never actually existed. This ShukerNature blog article is excerpted from my book The Menagerie of Marvels: A Third Compendium of Extraordinary Animals. 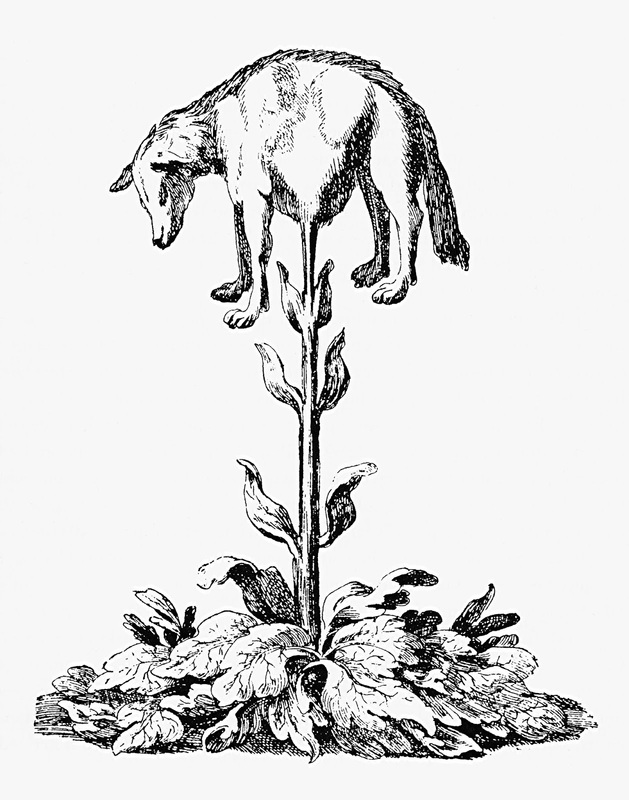 THE VEGETABLE LAMB OF TARTARY - HALF PLANT, HALF ANIMAL, WHOLLY AMAZING! That they have browsed the neighbouring grass away. 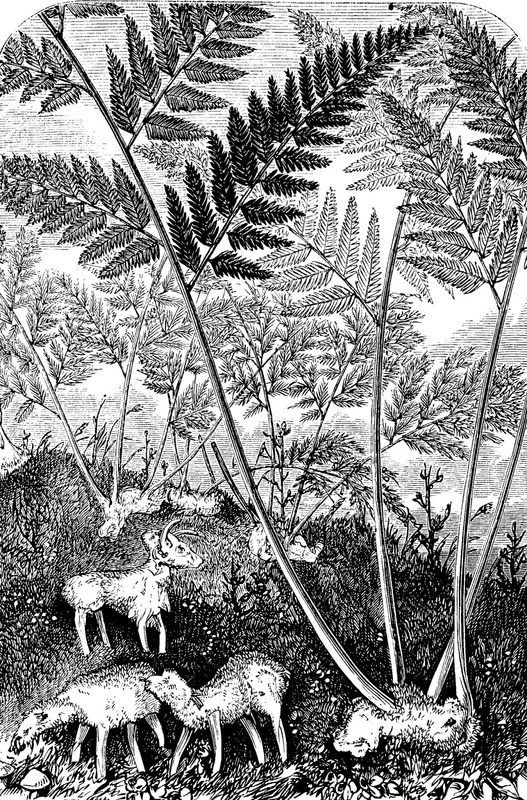 For many centuries, naturalists seriously believed that a small fleecy creature originated from a truly extraordinary plant's fruit, and was therefore a unique fusion of zoology and botany. 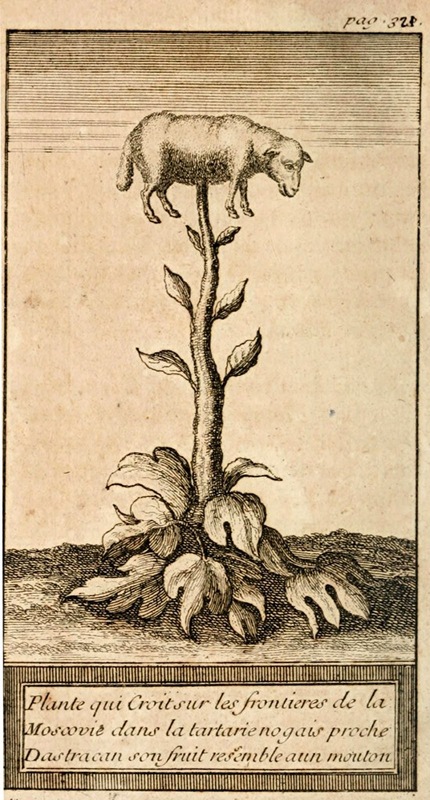 Hence its name – the vegetable lamb. 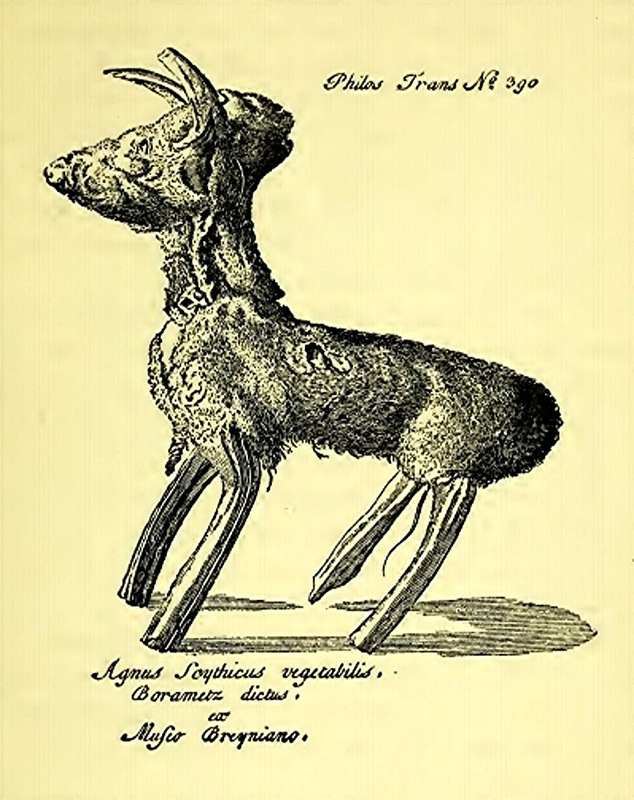 The most extensive modern-day documentation of the vegetable lamb, also known as the barometz or borometz, can be found in Jan Bondeson's fascinating book The Feejee Mermaid and Other Essays in Natural and Unnatural History (1999). In it, he reveals that lore relating to lambs supposedly growing out of the ground dates back many centuries in China. 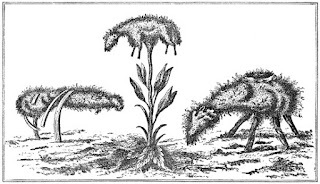 Moreover, the earliest known mention of such a creature anywhere appears in a Jewish text from 436 AD entitled the Talmud Ierosolimitanum, or Jerusalem Talmud, written by Rabbi Jochanan, which refers to the yeduah, a lamb-like beast that sprouted from the ground attached to a plant stem. 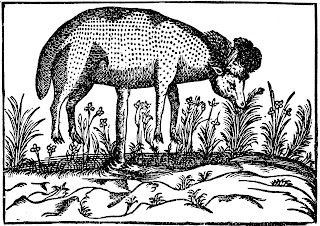 However, it was not until the 14th Century and the publication of a certain English nobleman's extraordinary travelogue that this bizarre plant-animal first attracted appreciable Western attention, after which it swiftly became a staple inclusion in any self-respecting bestiary. In later centuries, it was revealed that Mandeville had never existed and that his travelogue was a clever hoax, quite probably executed by a 14th-Century Benedictine monk of Flemish extraction called Jan de Langhe, ingeniously incorporating and interpolating tracts extracted from several earlier works penned by real writers (a medieval Italian Franciscan friar and explorer called Odoric of Pordenone in the case of this travelogue's vegetable lamb information). 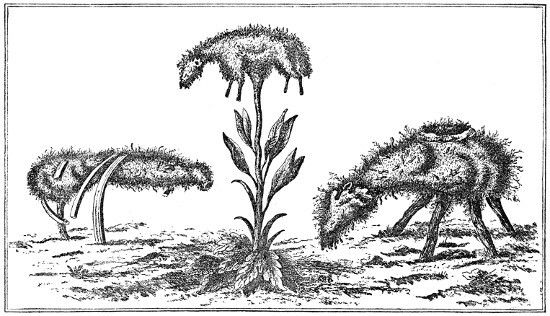 But by then, the fictional Mandeville's equally fictitious coverage of the vegetable lamb had firmly taken root, in every sense, firing both the imagination of Western naturalists anxious to see for themselves this true wonder of Creation and the inspiration of Western artists including depictions of it in religious illustrations. 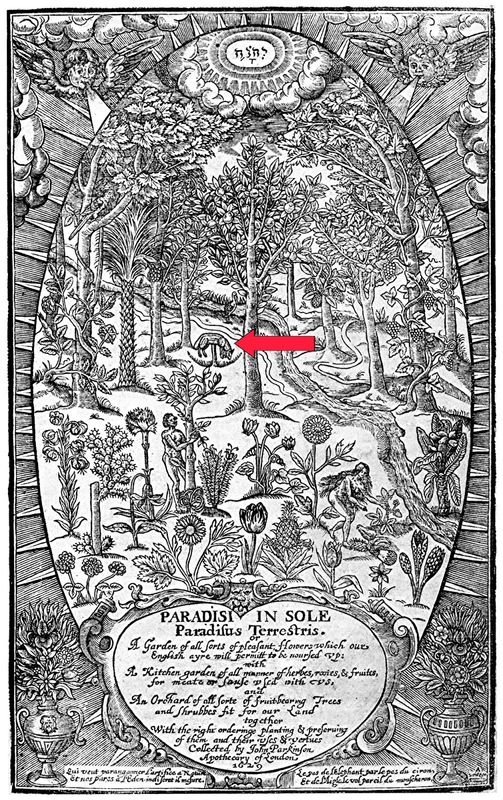 Perhaps the best example of the latter is the very detailed, ornate frontispiece plate included in English herbalist John Parkinson's monumental treatise Paradisi in Sole Paradisus Terrestris (1629), in which a vegetable lamb can be perceived just behind Adam in the Garden of Eden. Unfortunately for the vegetable lamb, however, as documented by botanist and fervent barometz believer Claude Duret in his Histoire Admirable des Plantes et Herbes Esmerueillables et Miraculeuses en Nature (1605), its flesh was very palatable (said by those who had eaten it to taste like crab meat) and its blood resembled honey. Consequently, it attracted particular gastronomic attention not only from humans but also from marauding packs of wolves, against which the little lamb had no defence. It could not even flee them, as it was irrevocably attached to its stem, and so was invariably torn apart and devoured by its ravaging attackers. Nor was that the only tragic fate that regularly befell this poor creature. Due again to its permanent tethering via its stem, once the lamb had eaten all of the grass and other vegetation within its reach it was doomed to starve to death, after which its plant progenitor died too. 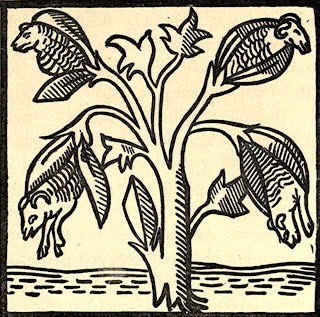 Yet although such tales and accounts made absorbing reading, even in that pre-scientific age scholars still sought physical evidence to corroborate them whenever possible - but what physical evidence existed to confirm the reality of the vegetable lamb? 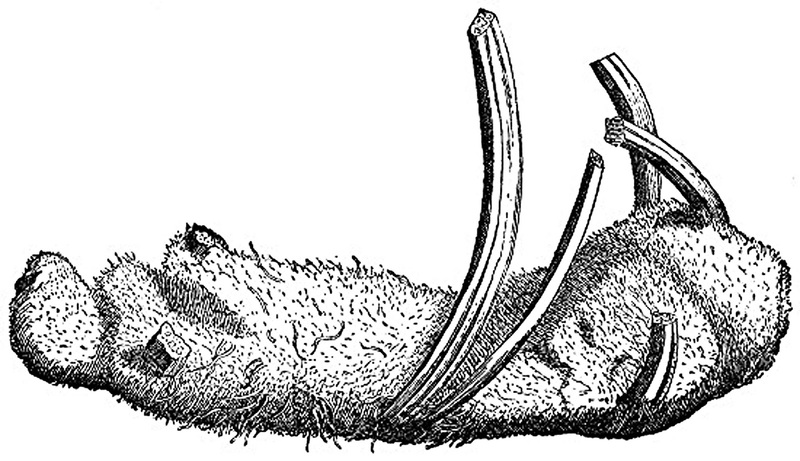 According to the Tartars, they utilised this creature's fine wool as padding for the caps that they wore on their shaven heads at night for warmth, and also – of particular excitement to Western naturalists – some Muscovites claimed that the Tartars would occasionally sell entire vegetable lamb skins, albeit only for inordinately high prices. As recorded by Jan Bondeson in his own comprehensive barometz writings, one person who was aware of such claims was Sir Richard Lea, who in 1570 had been appointed the ambassador of England's Queen Elizabeth I to the court of the Russian Tsar, Ivan IV ('The Terrible'). Moreover, he actually succeeded in obtaining a coat lined with vegetable lamb skins, after trading for it with the tsar an exquisite grinding mortar hewn from a magnificent piece of agate. 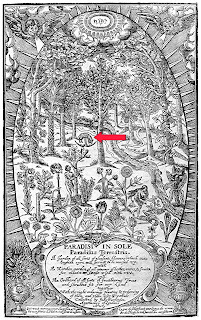 Upon his death in 1609, Sir Richard bequeathed this zoo-botanical (or phyto-zoological?) treasure for safekeeping and study to none other than Oxford's nowadays world-famous Bodleian Library, which had been founded during that same period of time by Sir Thomas Bodley (1545-1613). Sadly, however, his expectation was not met, as the coat was simply left to deteriorate in condition inside Sir Thomas's own closet. Despite attempts to repair and renovate it during the 1630s and 1640s, it was probably discarded not long afterwards, because by the end of that century its whereabouts were no longer known and have never been ascertained since. 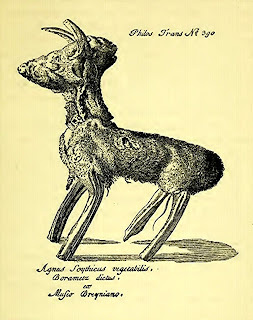 Notwithstanding this very regrettable loss (although 17th-Century German naturalist Dr Engelbert Kaempfer revealed that other such artefacts sold by Tartars were actually derived from the skins of unborn Astrakhan lambs), several entire preserved vegetable lambs have also been formally documented. 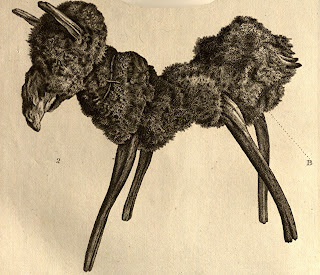 One, measuring just over 1 ft long, resembled a four-legged wooden branch covered in a shining dark-yellow fleece. It had originally been purchased from an Indian merchant by a Mr Buckley, and in 1698 it was exhibited at the Royal Society of London by the Society's Secretary, Sir Hans Sloane (whose own extremely substantial collection of artefacts became the foundation of the British Museum after he bequeathed them to the nation). 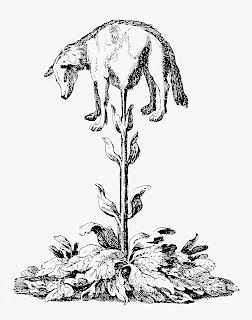 Moreover, Sloane exhibited a second preserved vegetable lamb at the Royal Society in 1725, this specimen originating in Russia and belonging to German physician Dr Johann P. Breyn. As Jan Bondeson has so aptly commented, however, it looked more like a fox terrier than a lamb! Sadly, both of those specimens are now lost, but at least two others do still exist. One of them is a prize exhibit at the Garden Museum in Lambeth, London, which I specifically visited on 6 February 2015 in order to see it. When I arrived, however, I was sad to discover that it was not presently on display, but after the museum's exhibitions curator, Emily Fuggle, learnt of my interest in mysterious and mythological creatures she very kindly treated me to a private viewing of their celebrated specimen, currently residing in the museum's store. 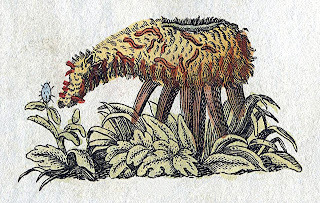 Standing in silent dignity, a mute and motionless marvel from a long-bygone age, the vegetable lamb of Lambeth peered ever outwards through the large glass dome inside which it was detained. This memorable specimen, probably created during the mid-1800s, was an unexpected but very welcome donation to the museum some years ago from a Cambridgeshire doctor whose family had hitherto owned it for over 150 years, but Emily informed me that it is now too fragile and vulnerable to the effects of light and photography from which its antiquarian glass cupola can no longer shield it adequately for it to be placed on public display at present. Happily, however, there are plans for this unique wonder to return on show at the museum as a permanent exhibit, housed inside a special new case affording it full protection, so I look forward to a return visit there one day to see it again. 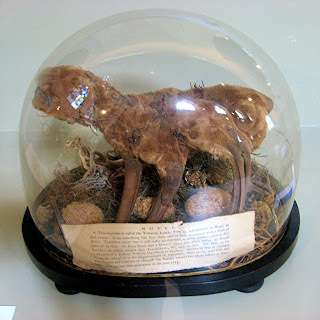 The second preserved vegetable lamb specimen, which has resided inside its very own chest of drawers for over 200 years, is maintained in the stores of London's Natural History Museum, having only been placed on display once – briefly, in 1934 – during modern times. 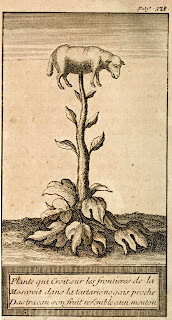 However, an engraving of it was prepared during the 18th Century by John and Andrew Rymsdyk, and appears in their Museum Britannicum (1778). 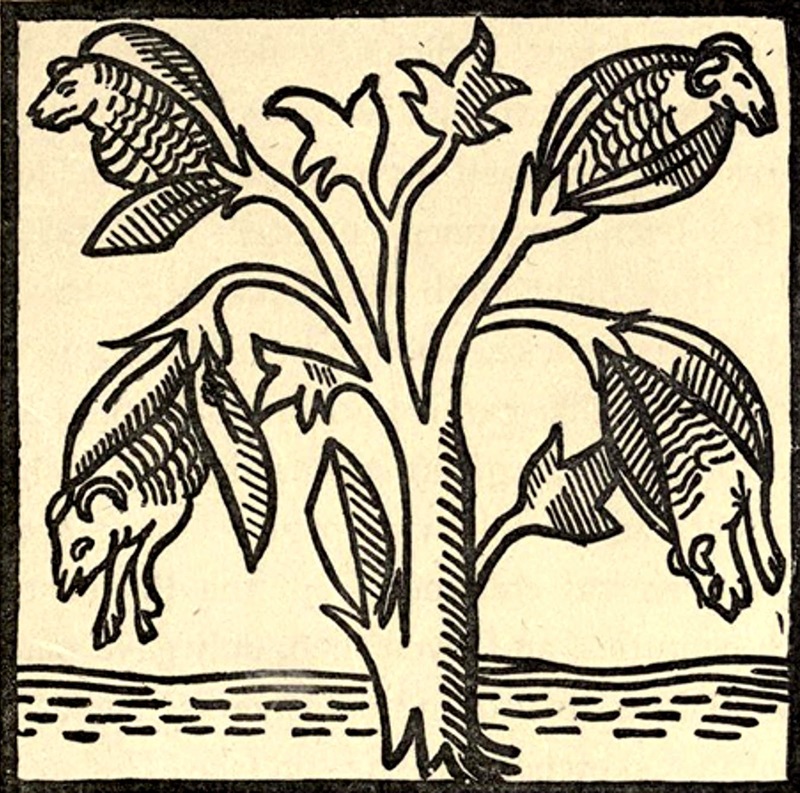 Needless to say, vegetable lambs do not, could not exist, and never have done – they are nothing more than an exotic, imaginative fable from the Middle Ages. So how can the preserved specimens be explained – what exactly are they? After examining the two examples that he exhibited at the Royal Society, Sloane had no doubts whatsoever concerning their identity. 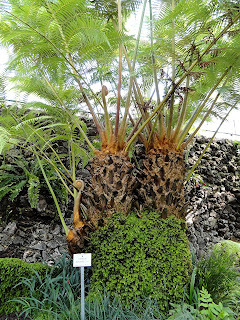 Both of them were nothing more than the inverted, hairy rhizome or rootstock of some form of large fern, whose roots had been removed, and four of whose frond stems had been retained but carefully shaved and modified to resemble slender legs. 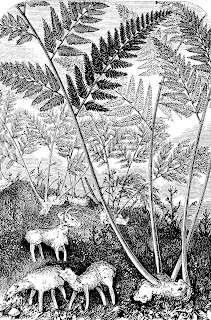 And the only reason why this correct identification had not been readily recognised earlier is that the fern species in question did not begin to be widely introduced into Europe from its native habitat in China and the Malayan Peninsula until the 1800s. 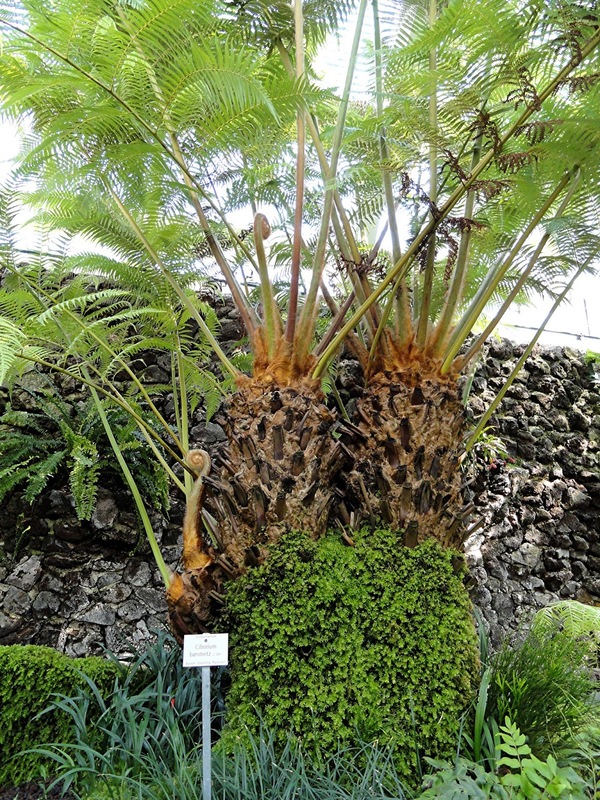 A very large arborescent tree fern that grows up to 3 ft in height and whose fronds can reach 10 ft in length when fully mature, it is nowadays commonly known as the woolly fern, and has been scientifically dubbed Cibotium barometz – both names commemorating its link to the vegetable lamb legend. All that remains to be answered, therefore, is how the myth of the vegetable lamb arose in the first place. 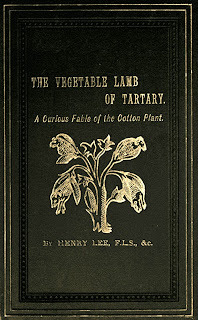 In a concise book devoted to this legendary entity, published in 1887 and entitled The Vegetable Lamb of Tartary, Brighton Aquarium naturalist Henry Lee proposed that it was inspired by the cotton plant Gossypium herbaceum, whose white clumps of fleecy cotton fibres surrounding the plant's seeds (revealed when its ripe seed pods burst during warm weather) superficially resemble tiny lambs attached to stems. This hypothesis has been supported by a number of subsequent researchers. However, as Jan Bondeson has tellingly pointed out, the cotton plant had been a familiar, widely-utilised species in Europe for centuries, and for even longer in China, yet with no suggestion anywhere on record of any myths or fables linking it to the production of lambs. So although initially appealing, Lee's proposal is definitely lacking in material support. 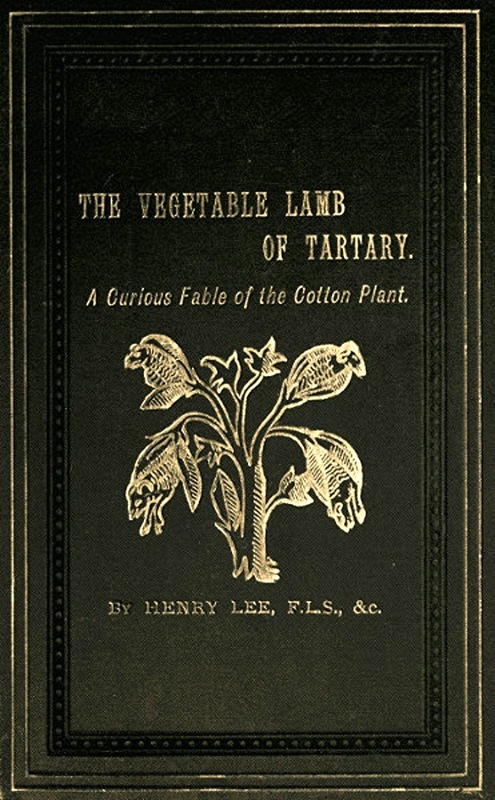 Consequently, although we know unquestionably that the vegetable lamb as a biological reality is an impossible concept, the riddle of how belief in this most fantastic of fantasy life-forms began, becoming an enduring myth in China, the Middle East, and thence Europe, still lacks a convincing answer even today. 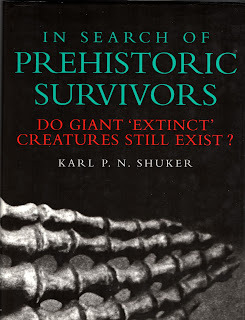 This ShukerNature blog article is exclusively excerpted and expanded from my book A Manifestation of Monsters.